Every now and then I need to make fun of myself. See, I’m afraid I’ve become that stereotype. That bread-baking, homeschooling, make-your-own mixes type of mama. Really, it was a slow, years-in-the-making process. Now, simple, money-saving steps are just part of my life. From our third child on, cloth diapers saved some bucks. Five years ago, my cousin helped us to see just how tasty stirring up our own homemade bread can be. Then pancakes, pizzas, biscuits, cookies and more. Bam. I was there. Bread-baking, homeschooling mama. Then we started making our own mixes. Homemade convenience. I forsook shopping for hand me downs and overstocks sales. One day recently, purely out of an act of avoiding the grocery store, I learned to make my own floor cleaner. Which then led to making 10 gallons of homemade laundry detergent. But part of the poking fun at myself is the figuring out. Finding the freedom in frugality. Here’s the thing. By the time I loaded everybody up to go through a drive thru I could have just as easily pulled something from the freezer I made during a batch cooking session. And expended a whole lot less in money and frustration. You see, when I make fun of myself, I am reminded that really it isn’t about a stereotype as much as it is about being a good steward of all we’ve been given. About eating what is good for us. And it was simple. Folks, I don’t have time for long, drawn out projects. But I can work in spurts. Often, it’s part of our education (the 10 gallons of laundry detergent took math brain power. And, hey we re-used two 6 gallon wheat barrels). 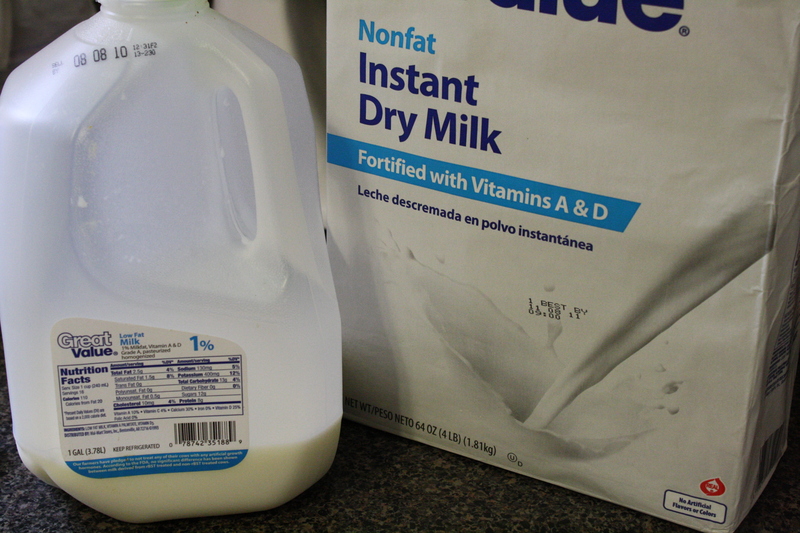 Now, my children don’t notice the taste when I mix in powdered milk when the jug is half full. They’ve grown accustomed to orange juice out of a pitcher. I found out how simple homemade convenience can be. And just how freeing having a bucket full of change is. How much better home grown really can be. Watch out. Next, I’m making yogurt in the crock pot. Interested in more? Here’s our Baby steps to frugal living and Angie’s What is a Proverbs 31 woman? And you’d certainly be blessed by Kerri’s What’s for Dinner? series. Plus there are plenty of frugal recipes and meal plans in our Hodgepodge cookbook. How about you? What are your favorite, easy and frugal habits? Most of our frugality comes in the food department – it is amazing how much cheaper it is to make pizza rather calling the delivery guy. That homemade facial cleanser sounds like our next project 🙂 Aha – vinegar, baking soda and water is what I use on my kitchen floor. You are smart to use it on the carpet too! Thanks Kendra! Keep adding as you think of more! I use it everywhere and add a little essential oil for a nice smell. We also cut up old t-shirts for papertowels. I have a roll of papertowels hanging up in the kitchen which I have to dust! Hi, this is Ryan from Alpha Omega Publications. Thanks for the heads up to your article! This is a great article with links to some very useful tips! I enjoy all this frugal living…as your youngest boy would say, “Cha-ching” goes the pennies, nickles and dimes saved each time these tips are used! Do any of you all can? I actually think that sounds like fun and am dying to meet someone down here that knows how to can food items!! Betsy: I do can, not as much as I used to..it is indeed fun and SAVES big money! There is a WONDERFUL website: http://www.pickyourown.org and it gives you step by step directions to can or freeze anything! Best of luck! Oh, how I wish I had learned this from my grandmother when she was still living!!! As I wish I had learned more about gardening from my grandfather! Not only do I greatly miss them but now I know and truly appreciate all the many ways they blessed me and that they were truly full of so much wisdom!!! I’d be happy to help you with any questions you may have. This year we made homemade cutting boards (which were a huge hit) and canned soups and jams for Christmas. 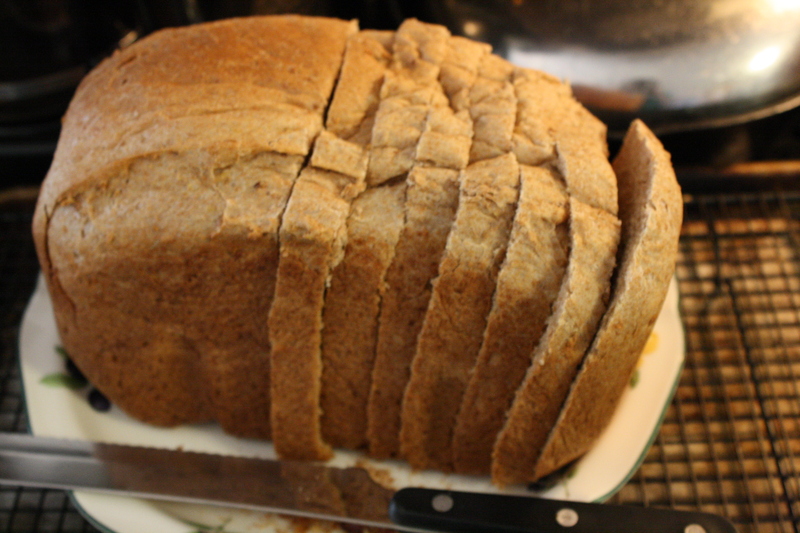 You have inspired me/reminded me – I need to bake more bread! Also, I want to try out some homemade laundry detergent. I was discourage the last time because I couldn’t find the ingredients. Thanks for the encouragement. I found the ingredients in the laundry aisle at my grocery store. Go figure. Every time I use my homemade laundry detergent I smile. I had always hated buying the overpriced stuff! I do however consider myself very frugal…I have learned to pay pennies on the dollar for those modern conveniences! But you already knew that! Can’t wait to read your first post! Kim – I cut the youngest two children’s hair. Steve buzzes eldest boys. I was noticing the front of Lil’ Buddy’s is a bit sideways. Oh, and yes! Leftovers! But they are getting a bit less frequent these days. We are much alike because I make my iced coffee every afternoon 🙂 I’ll think of you now. Betsy – I need to learn to can. My mother has made some of the Duggar’s pickles and she preserves figs and other things. Vicki – you are inspiring me to get back to cloth napkins. Why not? You are right – if we added it all up the bunch of us are saving lots of money. Trish and Heidi – maybe we should do a moms meeting topic on frugal living. Frugality is a great topic for a mom’s meeting. Awesome post and I have got to check out these home made recipes for cleaning!! Thanks for the post! Glad to know that I am not the only weird one out there that does these things. This is me!!! I think we even have the same bread maker! And I make yogurt in the crockpot by the gallon-full. We have our own dairy goats, so I even know where that came from. Love it! We are just starting to take some of those little steps you talked about. 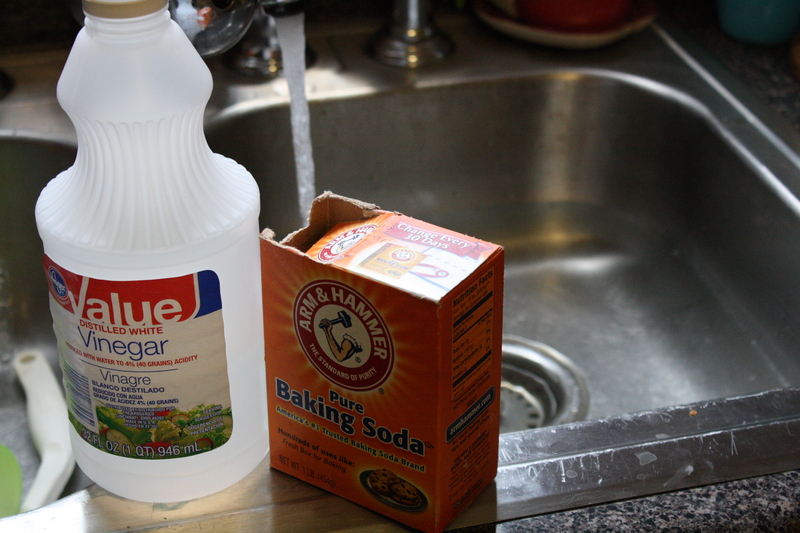 My favorites so far have been switching to No-‘Poo and using baking soda and vinegar to clean almost everything. Oh my, we’re living the same life. I’ve become one of ‘them’. THANK YOU!!! I just stumbled upon your blog and I thought my heart would leap from my chest! It’s wonderful. Thank you.